Description: Utilizing a blend of timeless craftsmanship and classic design, the ever-popular Citadel brings home unsurpassed quality and shapely appeal. 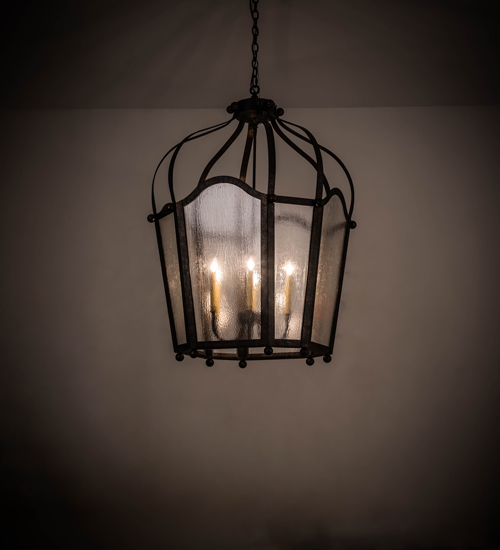 Evoking a dramatic effect, beautiful ambient light is projected through Clear Seeded Glass which reveals 6 Amber faux candlelights featured within this pendant. Citadel is enhanced with a dramatic frame and ballpoint accents featured in a Golden Bronze finish. The overall height of this pendant ranges from 46.5 to 93.5 inches as the chain length can be easily adjusted in the field to accommodate your specific lighting application needs. The fixture is handcrafted in our 180,000 square foot manufacturing facility in Yorkville, NY. Custom options available. UL and cUL listed for dry and damp locations.